If you drive one of the newer Ford F-150s, Super Dutys, or Expeditions...you should know that your vehicle's body is made of military grade aluminum. This reduces weight and enchances performance and economy. It also requires very different repair techniques, tools and equipment for safe, correct repairs. K&H Automotive is fully equipped with an aluminum clean room, as well as the trained technicians and equipment for proper aluminum collision repair. Here is one of the newer Ford F-150s undergoing collision repair inside our aluminum clean room. K&H is the only collision repair facility in Mercer County so equipped. 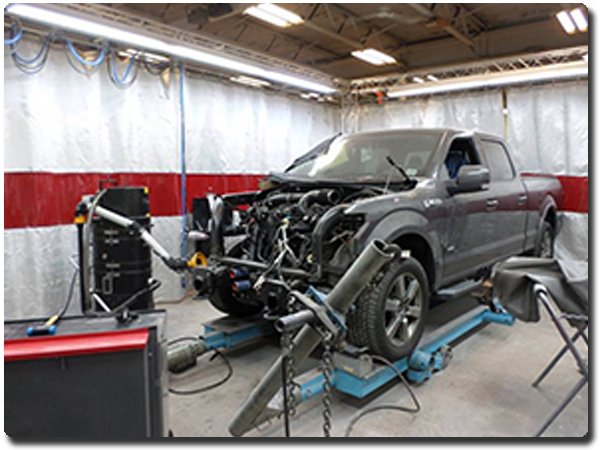 While we hope you'll never require our collision services for your F-150, Super Duty or Expedition...isn't it good to know that a qualified aluminum collision repair facility is nearby? The future is now when it comes to aluminum, and high strength steel, and composite materials. In fact, there are probably some of these in the car you drive. As one of the most advanced collision repair facility in Mercer County, K&H has made the commitment in technician training, tools and equipment to ensure safe, correct repairs with these advanced materials. We invite your visit or call for more information about what we do.